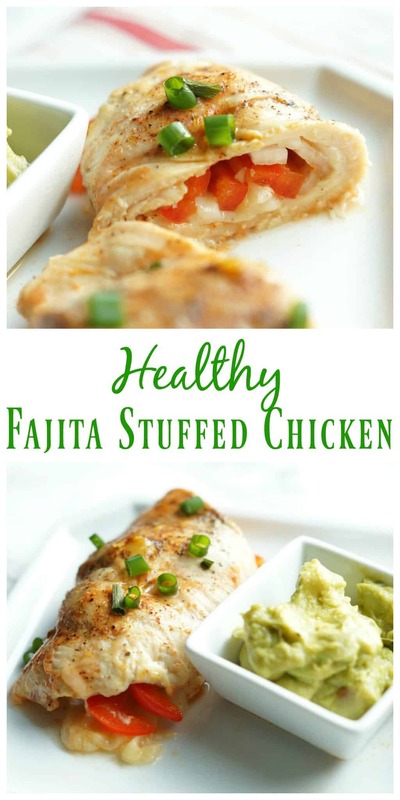 Healthy Fajita Stuffed Chicken is a quick and easy dinner that your whole family will love! Hi everyone! Amanda here from Old House to New Home, excited to be back sharing recipes with all of you in the New Year! 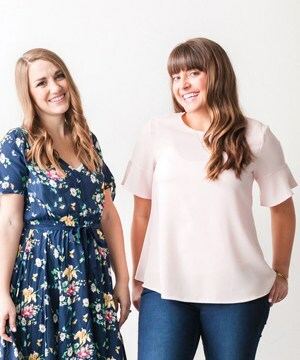 Its that time of the year when we sadly leave behind the rich desserts and cheesy comfort meals, and start looking toward some healthier choices! I love starting the year off on a healthy note, just wish I could keep it up throughout the year! 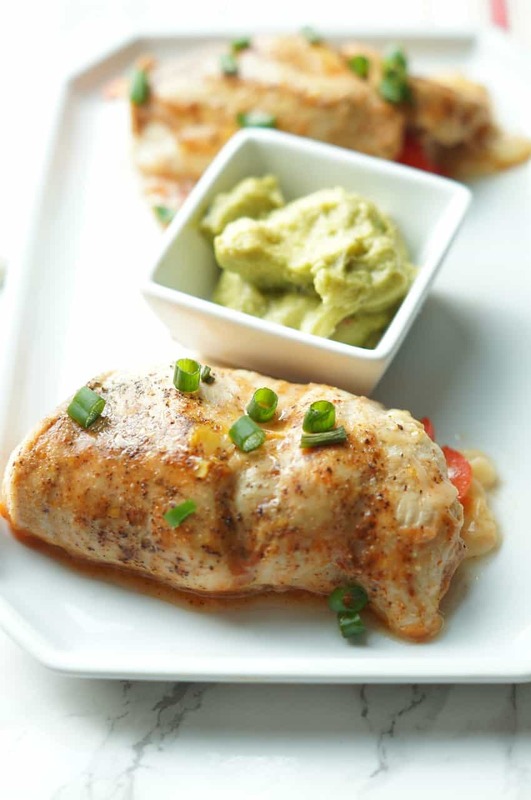 These Healthy Fajita Stuffed Chicken Breasts are not only light on calories, but so good that you don’t even realize you are eating a healthy meal! We love Mexican and Tex-Mex recipes in our house. They are usually quick to cook and are always crowd pleasers! I love to make a batch of slow cooker salsa chicken burrito bowls whenever I know we will be short on time around dinner. 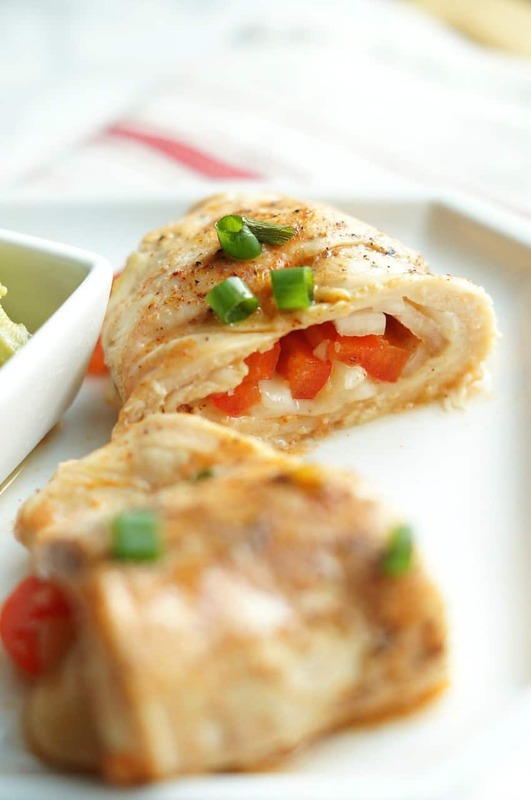 These Fajita Stuffed Chicken breasts are even quicker! I was able to prep the ingredients in about five minutes, and since the breasts are so thin, they cook in less than 15! I stuffed them with our favorite fajita fixings, onions and red peppers, a chuck of Monterey jack cheese, and then topped them with some store bought enchilada sauce. You could definitely make a homemade sauce, but I love the jarred variety for when I am trying to get dinner on the table quickly. You could even skip the sauce and just top with salsa, but I love the smokiness the enchilada sauce adds. You could make these even healthier by omitting the cheese, but a little cheese never hurt anyone, did it? I think it adds some great flavor and additional flavor to this meal. I love that the cheese melts out and gets ooey and gooey. 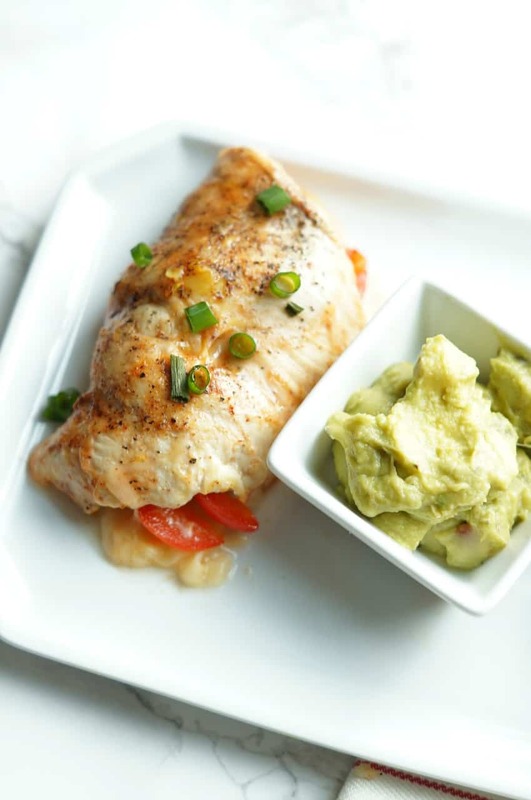 It is the perfect finishing touch to these already delicious chicken breasts. 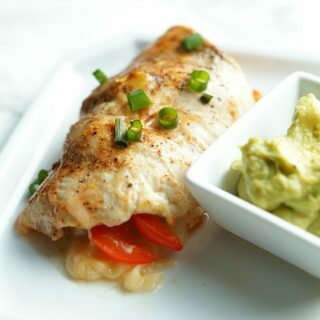 Looking for a healthy Mexican inspired meal? 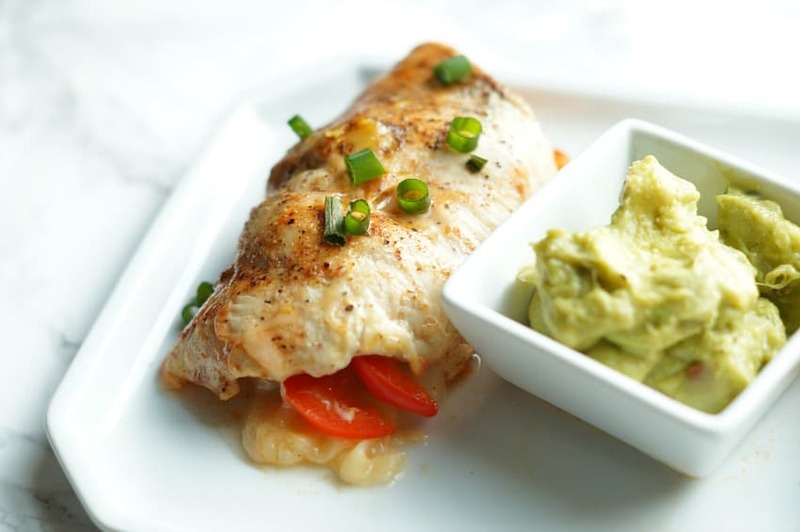 These Healthy Fajita Stuffed Chicken Breasts will be sure to find a place on your table again and again! Pour half the enchilada sauce into the bottom of 11 by 13 pan and spread to evenly coat. Lay chicken breasts out flat and sprinkle both sides with the salt, pepper, garlic powder, and chili powder. Place equal amounts of red pepper, onion, and 1 rectangle of cheese into the middle of each breast. Roll the breast up tightly and place seam side down in the baking pan. Pour the remaining sauce over the tops of the chicken breasts. Cover with aluminum foil and bake for 12-15 minutes, or until chicken is cooked through. It may take longer depending on the thickness of your chicken. Remove from oven and top with your desired toppings. If you need another awesome and healthy dinner idea, these Healthy Buffalo Chicken Bowls are AMAZING!